'MY WRITING speaks about life and death," Alurista says. "It speaks about passion. About beauty and the absence of beauty. But it also deals with the social and political contradictions of our life. If you are an artist and you are not addressing these things, then you are saying something about these things by not addressing them. Silence is also a statement. There is no such thing as classless art. There is no such thing as art for art's sake. That's an illusion." It is easy to imagine Alurista as he was in the late 1960s, throwing out words like rifle bullets across a crowded cafe, the classic image of a young revolutionary artist. Black goatee punctuating a fiercely lean face. Dark eyes piercing. Sweat running in rivulets from under a dark beret. Muscular fist punching the air as he pours out words from his heart, and the assembled brown masses rock in unison and sway to images and rhythms that strum guitar strings in their hearts, declarations of freedom for a greater Chicano Nation. "I write my poetry in line with the ancient Mexican tradition. They considered poetry a form of dialoguing with your heart, and with your community, and with God. Poetry that related the heroic acts of the people. And mystical poetry, poetry that asked, 'What was the meaning of death? What was the meaning of life?' And, of course, love poetry, poetry that has to do with the passion of life." "There is no single figure in Chicano poetry who is as important in this generation as Alurista was in his," says Kirsten Silva Gruesz, assistant professor of literature at UC­Santa Cruz. "And he can still get the attention of the crowd." She calls Alurista's activities in the 1970s a "golden moment" in Chicano cultural history. "He was the first Chicano poet in this country to publish in both English and Spanish," adds Maribel Alvarez, executive director of MACLA (Movimiento de Arte y Cultura Latino Americana) in San Jose. "It goes to the whole concept of what is a Chicano. By definition, a Mexican-American has claim to being both a Mexican and an American. Alurista came from a generation that looked away from Mexico and was brought up speaking English. Writing in Spanish was a process of reclaiming our language and our connection to our heritage. Of course, nowadays, writing in both Spanish and English is standard fare for Chicano poets. But before Alurista, to do that in a literary form was unheard of." "He was totally revolutionary," Alvarez concludes. Was he a revolutionary in the '60s? "Yes," Alurista replies. "I still am." The revolutionary, if not necessarily the revolution, has come to the valley. LATE LAST YEAR, Alberto Baltazar Urista relocated to San Jose to pursue his work in the Chicano cultural and political movements. Is he a political/artistic giant walking among us whose presence will soon be known to all, or is this the case of a man who helped spark a radical movement, but whose time has passed him by? Thirty-five years or so of artistic, political, academic and personal struggle certainly seem to have mellowed Alurista considerably, but they have not fully doused the banked fires of his spirit. Today, the poet Alurista relaxes in shorts at an outdoor table at a South First Street coffee shop, patiently rolling his own cigarette, sipping a nonalcoholic beverage, discussing the Chicano poetry movement and the reasons behind his move to San Jose after living much of his life in San Diego. From time to time, to jog his memory, he reaches into a soft-leather handbag to pull out a paper or a book. He seems to be anything but the typical image of a radical firebrand. He is a small man, perhaps 5 feet, 4 inches or so, who carries himself humbly, without the aggressive body language one might expect from a revolutionary. He smiles a lot, an engaging smile. The dark eyes are large and sad and gentle, with only the occasional flash as he makes a point. The brown face is sun-weathered and lined under a sporty black cap that would be more appropriate for partying at Fuel nightclub than picketing in a field. A grandfather, he will soon be 52. He has a pocketful of degrees (a 1970 bachelor's in psychology from San Diego State and a 1979 master's and 1983 doctorate in Spanish literature from UC­San Diego. ("They call it Spanish literature," he explains, "but my focus was Chicano literature.") He has published eight books of poetry, most recently with Bilingual Press of Tempe, Ariz. Locally, his last two books--z eros (1995) and Et Tú ... Raza? (1996)--are available at the Inca Gardens Restaurant in San Jose. SUNDAY AFTERNOON at Fuel, with a warm breeze blowing through the open window, Alurista is in his element, holding court at a table with two other Latino men. What you notice most across the room are his small, animated hands, which talk along with him as if they were a chorus. His smile is both infectious and perpetual, giving the appearance of a man who either has nothing to feel sad for or has decided that the bad times are just not worth worrying about. From time to time a friend or acquaintance wanders by; Alurista greets them all with a Buddhist pressing together of his palms and a discreet bow of the head. It is an eclectic crowd, mostly 20s and 30s, perhaps half Latino, half Anglo, a mixture of slacks and dresses and shorts, with flowered shirts, sweats and Ts scattered among a few starched whites of the older Chicano men. The club is rocking with the sounds of El Vez, a Chicano Elvis spoofer and his L.A. band. There is no audience dancing on the floor today. Physical gyrations this afternoon are supplied by a pair of female backup singers (one from Veracruz, one from Montreal) in iridescent silver-black hip-huggers and skimpy tops. Almost every song has a message of Chicano pride or liberation, but this is no heavy-handed political diatribe. In a song about the Chiapas revolution set to the tune of Chuck Berry's "Johnny B. Good," a shimmying, bare-chested El Vez shouts, "Go, go, go, Zapatistas!" while the backups jump off of the stage, firing pistol-fingers into the crowd. Other songs, also in a driving rock & roll beat, parody Mexican immigration woes or the coming of the conquistadors to the Americas. When the singers take up the chant "Viva la Causa," the crowd pumps fists in the air and shouts along. At his table, Alurista grins and claps and seems to be enjoying himself immensely, his body swaying and threatening to create a dance floor on its own. The poet Alurista certainly seems a man in step with his own people. And the revolutionary spirit--theirs and his--remains intact. THE YEAR WAS 1969--a pivotal year in the history of the Chicano movement. The United Farm Workers grape boycott under César Chavez was in its fourth year. Chicano students were demonstrating at high schools and colleges throughout the Southwest, demanding courses in their own history and culture. Many young Chicanos were joining the Brown Berets, a paramilitary organization inspired in part by the Black Panther Party. Federal officials were combing the country for the fugitive Reies López Tijerina, who two years before had led a group of armed followers to seize land in New Mexico for a Chicano state. To capitalize on this storm of activity, some 2,000 Chicanos met in Denver at a Youth Conference, hoping to form a plan of unity. One of the speakers at the conference was the 22-year-old Alurista. The crowd grew still as the diminutive poet with the booming voice read a poem called "El Plan Espiritual de Aztlán (The Spiritual Plan of Aztlán)." Aztlán, the mythic home of Chicanos, is defined as the Southwestern section of the United States lost by Mexico following the War of 1848 and including the states of New Mexico, Arizona and California. It was a heady time for a young, unknown poet and activist, speaking before the assembled young leaders of his people. Alurista describes the moment with no small amount of pride as the high point in his poetic career. When Alurista was finished, the crowd burst out in applause and raised-fist shouts of "Viva la Causa!" "Wow! Everybody said, 'That's not a poem; that's a proclamation!'" Alurista recalls, still obviously excited by the moment. "Everybody voted for it. It became the preamble to 'El Plan de Aztlán,' which was our community plan of action." "In the spirit of a new people that is conscious not only of its proud historical heritage but also of the brutal 'gringo' invasion of our territories," the Spiritual Plan read, "we, the Chicano inhabitants and civilizers of the northern land of Aztlán from whence came our forefathers, [are] reclaiming the land of our birth. ... With our heart in our hands and our hands in the soil, we declare the independence of our mestizo nation." The Spiritual Plan resounded like the shriek of an eagle over Central Valley lettuce farms and dusty desert pueblos, a cry for freedom and independence. It vaulted Alurista's work into national prominence. But these days, while still holding onto the dream of an Aztlán nation, Alurista downplays the '60s-style racial militancy and violent rhetoric of the "Plan Espiritual." "We were never exclusivist," he insists. "Our nationalism has always been inclusivist. The black-white conflict in America was a racial conflict. But with [Chicanos], the differences are more cultural and linguistic than racial. We have Asian blood. We have European blood. We have Indian blood. That's what makes us Mexicans. In my own family I have children--one that looks African, one that looks like a Viking and one that looks like a gypsy--all of them my children, all by Mexican mothers. [Chicanos] are the living example of integration. We are the Rainbow People." And while still calling California "occupied Mexico," the poet disavows any lingering territorial claims. "People call California, Arizona, Nueva Mexico and Colorado Aztlán, but really, Aztlán is wherever we are. We don't recognize borders. It's more a matter of cultural/political identity. When I say this is our land, I don't mean that we own it. Who owns anything?" ALURISTA'S INTRODUCTION to poetry came early, while he was an elementary school student in his native Mexico ("the state of Morelos ... Zapata country," he says with a small shimmer of pride). "I was the official orator of my grade," Alurista relates. "I got the position because I had a good speaking voice. They had me memorizing these long poetry pieces about the flag, about the country, about mother. Any national celebration that required a display of culture, I had to memorize these things, and then I had to stand up and declamar." Later, he began writing poetry as part of a scheme he worked with a girl he met at the Catholic nuns' school across the street from his school: "We were both on scholarship, and we were both in the same boat--no money. So we started talking one day about how we could get some of these rich students' money. She came up with this idea of my writing love poetry to girls at her school from boys at my school. We'd charge each of them 25¢. It worked. That's how I got going writing poetry. Cyrano de Bergerac, without knowing who the hell that guy was." When Alurista was 14, an aunt invited him to come to San Diego to live with her. "I said, 'What a gas! I can go study in the United States, and I'll get to see Mickey Mouse.' "
He did get to Disneyland two years later, but once here, he says, he began to develop his social and political consciousness. "I was studying things like Marxism, but I was coming into conflict with a lot of Marxists who got their ideology out of books, but who didn't have connection with any community, with any people." 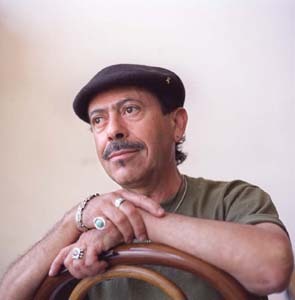 Alurista was greatly inspired by César Chavez and the United Farm Workers' drive to organize migrant workers in California's Central Valley, and he himself organized university students to support the UFW's grape boycott. 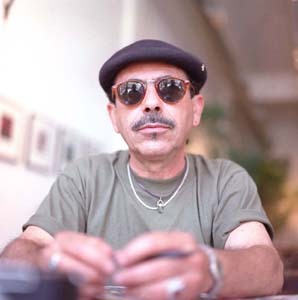 By the late '60s, he was writing and performing poetry in addition to becoming an active soldier in the Chicano movement, helping to found such groups as the Movemiento Estudiantil Chicano de Aztlán (MEChA), a militant Chicano student organization; MAYA (Mexican American Youth Association); and Toltecs in Aztlán, an artists' group. He was also instrumental at San Diego State University in the successful struggle to establish the first Chicano studies department in the nation. It was in this turbulent period that the name "Alurista" was born. "There were a lot of mass mobilizations and confrontations at that time, and I was pretty involved," he explains. "My apartment was shot up by the Minutemen [a radical, right-wing paramilitary organization]. I didn't want these people to be able to associate my last name [Urista] with my family, so I changed it." The change was also ideological, a part of Marxist theory. "It's dialectic," he says. "The notion was to synthesize--to bring things together. So I tried to do that with my name." HE HAS MOVED from San Diego to San Jose, Alurista says, because "politically and culturally speaking, the city has become the most progressive for Mexicans of any other city in California. I mean, where else would you have a city council set aside over $30 million for the development of a Mexican-American cultural arts center? Not even in L.A., and L.A. is supposed to be it. This is where you will have an Asian and Amerindian community that will eventually be more powerful than the Anglo-American community." Already, aside from the mayoralty of San Jose (Ron Gonzales), Mexican-Americans occupy many of the top political positions in California: lieutenant governor (Cruz Bustamante), Assembly speaker (Antonio Villaraigosa) and Senate majority leader (Richard Polanco). If a rising brown tide could make Chicanos a major state political power in the next century, San Jose would almost certainly be an important part of the mix. Alurista laments the fact that mural activities in San Jose are "very skimpy," but he says that the absence of edifice art is more than made up for by a "very, very strong" Chicano theater community. "We've got several active theater groups: Teatro de Los Pobres. Teatro Visión. Familia Aztlán. There's other cultural groups here, too, like folkloric and Aztec dancing groups. And the music scene in San Jose is great. If they had membership, I'd be a member of Fuel. I go there all the time." UCSC assistant professor Gruesz agrees that the San Jose cultural community is beginning to come into its own. "The San Jose Chicano community is more stable than it used to be," Gruesz says. "There have always been a tremendous number of Chicanos living in the city. But in order to support a full cultural life, a community has to have a sense of cohesive solidarity. That seems to be present now in San Jose." Chicano culture flourished in Southern California cities like San Diego and Los Angeles, Gruesz explains, because their proximity to the border allowed a free back-and-forth exchange with the source of Mexican culture. "San Jose is catching up because it is becoming a border city, too," she continues. "We're recognizing now that there is an emotional, social and cultural border that goes far beyond the actual geographical line. In that sense, the Mexican-U.S. border is pretty wide. All this is part of a general renaissance in Chicano arts. Interest in Chicano literature is skyrocketing among students." Another reason for Alurista's relocation was the chance to participate specifically in a Chicano poetry renaissance in the Silicon Valley capital. But ironically, he is highly critical of the very form in which that renaissance appears to be prospering in the valley: performance poetry. "San Jose is experiencing a whole new wave of Chicano poetry development," says MACLA's Maribel Alvarez, noting that young Chicano poets in large part are "experimenting with hip-hop forms of expression." As an example, she cites a recent MACLA-sponsored regional poetry slam, participated in by some 200 Chicano poets from around the Bay Area. "The energy there, you could cut it, you could feel it," she says. "It's standing-room only. People are attentive to every word. They sigh when someone delivers a good line, and they laugh at the punch lines. It was like the atmosphere used to be up in North Beach. Or an older man, he came, and he said it reminded him of the old beat poetry readings in the Village, in New York." But the poet Alurista has nothing good to say about Chicano performance poetry, particularly as done in poetry slams. "That's not Chicano poetry," he explains quietly, and there is a steel-blade sharpness to his voice that for the first time reveals a bit of the passion behind his convictions. "It's nice that they're doing it, but it's not part of the tradition of Chicano literature." Tracing timelines on the tabletop with his finger, he explains that the Chicano written poetry tradition goes back perhaps as far as 5,000 years to the time of the Mayas and Toltecs. Drumming, flute-playing and dancing often accompanied the poetry readings, but Alurista points out that music and other accompaniments were designed only to embellish the written word, not supplant it. "Performance art is great, but is it poetry?" he asks. "Will it survive the test of time? Once it's performed, it's done. The spoken word has its place, but it's ephemeral. Sometimes we find many of these performance poets ... the performance is great, but if I see it on the page, it doesn't hold up. It works only because of the music, the theatrics involved, because of the visuals involved. The tradition it comes from is rap music, not Chicano literature. The whole rhythmic cadence is from rap. It's not chiseled. It's not refined. It is not honed. It's rap, and I defy any of these poets to say otherwise." que repíteme por qué? why? BUT IF ALURISTA has removed himself so far from where young Chicano poets seem to be flourishing, how well will this icon of the movement fit into the San Jose Chicano poetry scene? MACLA's Alvarez is carefully diplomatic. "Alurista represents a crossing over of the old Chicano literary movement," she ventures. "But now we've got a new wave of Chicano poetry that is going in a different direction. We certainly honor the work that came before us, but right now we just don't know how members of the old school will fit in. But we certainly find it interesting that someone as important as Alurista will be part of that dialogue." After many years of working on the university level, Alurista says he is washing his hands of academia. "It's become reactionary, a bastion of conservatism," he says, not at all like the 1970s, when many colleges and universities provided support for progressive movements. "Chicano studies today, we're almost back to block one," he continues. "We still have to argue for its legitimacy. Academia was hoping Chicano studies was just a passing fad and [would] melt away, but it hasn't gone away. So they have reduced it to a level of inefficiency." He sees his future as working for progressive Chicano organizations such as MACSA (the Mexican American Community Services Agency, a private nonprofit organization serving Mexican-Americans in Santa Clara County). Presently, he works part time teaching middle school children Chicano literature in the Mountain View School District. Meanwhile he is completing work on an unnamed novel, which he says should be finished this August and which he expects to be published by Calaca Press of San Diego. He is also working on a play, Ketzalcoatl and Zihuacoatl, which he expects to be performed by the theater group Familia Aztlán. He dodges questions about rumored substance abuse problems that dogged him in his last years in San Diego, remarking only that "in the life of most artists--since most artists in general are sensitive people--some form of self-abuse has plagued them." But Alurista does acknowledge that he is pulling himself out of a period of personal "spiritual meandering" that lasted from 1995 to 1998. "Being an artist is not all creativity," he says. "There are periods of self-destructiveness. You internalize things that destroy you. You end up blaming others for your pain--whatever or whoever those 'others' happen to be--which makes you a resentful person. That resentment turns inward, and you end up eating yourself up." But he adds that pain is not a bad thing for an artist. "I don't think you can love without aching." He says that he has been married twice, with four children in their 20s from the two unions. Is he still married? He rolls his eyes. "Noooo. Marriage was fine. One was for seven years, the other was for 15. They were very good experiences. It's been 10 years since I became single. I guess I'm ready for another relationship now, but ..." he stares at the sky for a moment, "how can I say this? ... It's taken a while to breathe and bury those experiences. I'm not engaged. I don't have a girlfriend or nothing. I just have fun. I go dancing. And I have a very close relationship with my children. Keeping in touch with them, that's more important to me than anything else." The interview almost concluded, Alurista begins to gather his things. "I know what I've had to do to get my life in balance," he says. "I have to maintain my spirituality as well as my connection with my community. I never gave up my community, but I did give up my spiritual life." He describes himself as both a Catholic and a Buddhist, with the Catholicism for its rituals and the Buddhism for its meditative practices. "I also engage in Native American ceremonies," he says. "Sweat lodges and things of that nature. I'm connected to my Father Sun and my Mother Earth and my brothers and sisters, trees and ants and what not. I am able to travel astrally. I am able to do things that show me that everything is connected, man." He pauses in thought, trying to make sure he got everything in. "Oh, and I'm a Socialist. With a definite Mayan bent to everything." From the August 5-11, 1999 issue of Metro, Silicon Valley's Weekly Newspaper.